Becoming a trip leader is one of the best ways to get involved in the club. Our volunteer leaders are what makes sets AMC apart as the best outdoors club in the East. Unlike other groups, we have a dedicated and trained core of individuals that lead all of our activities. The AMC is dedicated to the continuing education of our trip leaders to broaden their wilderness and group management skills. We provide scholarships and matching funds for additional training for all of our trip leaders for advanced training. Take the time to enjoy several of our trips. Talk to our volunteer leaders and ask what keeps them leading trips year after year. By keeping active and leading trips you will be giving back not only to the people on your trips but you will also be working to keep our outdoors accessible for everyone. 3. Have attended at least 2 AMC Outings for the Activity seeking leadership status. 4. Be physically capable of performing the duties required of leading an activity. 5. Attend one of AMC’s Leadership Training Workshops where you will be instructed on AMC’s Leader Commitments and Expectations. Please note that you may take this class at any Chapter led or staff led program. 6. After completion of the Training Workshop your name will be forwarded to the Committee Chair for the activity you wish to become a leader in. The Chair will pair you with a Mentor to guide you through the final stages of becoming a trip leader. Your Mentor will be your first point of contact for questions and concerns that you have. 7. You will be required to complete the requirements set forth by the activity committee you desire to attain leader status. Taking the class and performing your co-leads are not a guarantee that you will achieve leadership status. The committee chair is the final approval authority. Each of the leaders that you co-lead with will evaluate and report to the committee chair on your progress as a leader-in-training. AMC is dedicated to the safety of our club members. 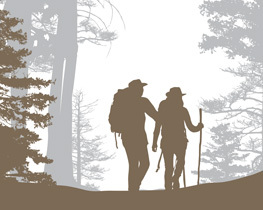 Wilderness First Aid is offered to all trip leaders and highly encouraged. Certain committees require the class. Activity Committees will reimburse leaders after successful completion of the class. You can either SEARCH, SEE A LIST OF ALL TRIPS, DOWNLOAD AND PRINT A SCHEDULE, or click on a date to find NY-NoJ chapter trips. Anyone venturing to the caves today or this weekend? If so, say Hi to a friendly Bat. #BatAppreciationDay http://www.batcon.org/why-bats/bats-are/bats-are-important..
BOAT DEMO DAY & BARBECUE Saturday, April 27, 2019 Jamaica Bay, Brooklyn Come try all types of boats to help plan your season’s future instructional..